The word “concrete” derives from Latin meaning “growing together”. A technology developed by the Romans and lost for centuries, it has become the ubiquitous modern material. Simply put, it is a matrix composed of cement, aggregate, and water. Blended together, these basic ingredients morph from liquid to solid, and crystallize over time into an entirely new substance. Faithfully assuming the form into which it is placed, concrete is a construct of intentional design. In the broader sense, concrete means solid, tangible, and real. Details are the finer points that give relevance to broad gestures – they bring character and expression to what otherwise be commonplace. They convey identity and value through a careful investment of intent. Details are the distinguishing qualities that appeal to the perceptive eye and soul. These interconnected concepts of the “overall” and the “distinct”, the “general” and the “specific”, come together to form a whole system and a design synergy: a unified moment of creative response to an environment. Captured in solid form, this is Concrete Detail. I recently interviewed concrete artisan Richard Holschuh to learn more about concrete as an interior finish material, his methodology for working with the material, and the finished ethereal qualities of one of the oldest known building materials. I’m a technician (well-versed in tools and materials: making “stuff”), learning to find and trust my inner concrete artist. Having worked in construction as a carpenter most of my life, I can readily implement a set of drawings and arrive at a given result. Taking that beyond the prosaic act of straightforward “doing” and into the realm of abstraction and then conceptualization is the welcome challenge I find before me now, as I become immersed in artisan concrete. I say “artisan concrete” to distinguish it as a creative, versatile medium well-suited to the task of rendering functional art, in the form of countertops, sinks, surrounds, and other surfaces. My goal is to imbue this commonplace material with uncommon grace, expression, and personality. When the maker and the made begin to flow together and are given directional impetus by a client’s needs, the end result can be amazing. It is truly a synergy of people, places, and the physical. And perspiration. It’s not as easy as it looks! What are some of the practical aspects or considerations of using concrete as a finished product? There is no ideal surface; they all have their inherent characteristics. I think I can say (without stretching it) that, design-wise, concrete is the most versatile material available. The reason is this: we’re working with a fluid that becomes a solid mass, faithfully assuming the form into which it is placed. So, the considerable care and skill (and inventiveness) invested into the form, or mold, will determine the result, by default. Simply put, this is a creative process – we actually MAKE this, virtually from the simplest of materials; nearly all other architectural surfacing options are a subtractive process, machining a (basically) two-dimensional cutout from a sheet stock of one type or another. It can be quite limiting, whereas we create “from the get-go” and can work in three dimensions handily, without having to assemble a whole from “what’s available”. This is why I prefer the term “artisan” over “fabricator”. Functionally, concrete will perform at least equal to most other solid surface materials, such as natural stone, acrylic, composites, engineered stone, etc. It can be priced very competitively, especially considering its handcrafted origins. Finally, I must point out that “not all concrete is created equal”; the end result is very dependent on the vision (both aesthetic and technical) and abilities of the artisan chosen. A major case in point is the sealer used on the final product (that’s another story). Concrete doesn’t have to be stain-prone. Or crack… I guarantee against cracks. Can you describe the process you go through when making a counter top? Since precast artisan concrete is custom by nature, the process necessitates close collaboration between the craftsman and the client. The objective, of course, is to draw upon the vast array of techniques available through the medium in order to create an appropriate design response. While the choices can be bewildering, a good designer will help to steer the conversation in the right direction. Restraint becomes liberating. I am particularly interested in colors and foreign object inlays. How does someone know what color they will be getting? do you have a sample mock-up process? Choosing a color is one of the first steps. Any color or combination is possible – we work with a concrete coloring supplier that can match Benjamin Moore’s palette. We simplify this by offering a 16 color standard palette (4 x 4 chips available) with a full custom option (in this case we do mock-ups). Typically, these are integral pigments made with powdered oxides; other coloring techniques include acid staining, surface dyes and washes, and multi-colored casting. After the color decision is made, we move on to other aspects: this can include embedding objects in the surface such as fossils, crushed glass, stainless steel bars, or your company logo. Features such as pitched drain-boards, built-in trivets, fruit bowls, and recesses to house a cutting board are often included. The possibilities are only limited by one’s imagination (and design sense). What are some of the design standards (thickness, weight) people who want to design a concrete counter top should know? Our standard thickness (if there is such a thing in custom work!) is 1 ½ inches; while any edge profile is possible, a pencil or eased square edge is very often chosen. Under-mount sinks are usually specified, but we also create integral concrete sinks in any shape, especially in bathrooms. Clients are often concerned that the weight may be an issue, but concrete’s mass is similar to granite, at about 18 lbs./sq.ft. Modern cabinetry can handle this load with no problem, as it is spread evenly around the perimeter. Integral reinforcement, both primary and/or secondary, are used as a matter of course and as needed to handle special stresses, such as overhangs, clear spans, and narrow sections such as the front and back of a sink hole. The templating and installation steps are nearly identical to any other countertop material, so there is very little time actually spent on site. The processes of actually forming, casting, and finishing the tops are all performed in the shop/studio, to maintain quality control and strict oversight of the many details involved. How long does the process take once your services are retained? The typical turnaround time on an individual project, once critical decisions are made and templates have been taken, is three to four weeks. Technically speaking, we can complete the actual fabrication in about 7-10 days of actual work, but there are always bumps and delays and concrete takes time to cure properly, so we need to build in some reality time for scheduling. 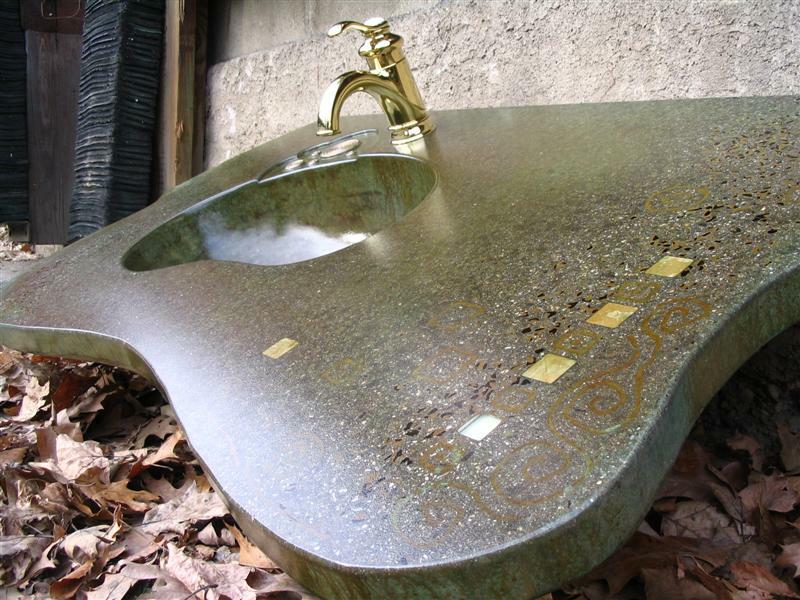 Some more complex jobs, such as forming a custom sink, can take a little more time. It’s the front-end portion – design and decision-making – that takes the longest, to be honest. How does the cost compare to other counter top choices? The cost for this custom work can vary widely, as you might expect. However, we often ballpark countertops on a square foot basis, with added features affecting the bottom line as the design process proceeds. The unit price ends up being very competitive with other mid-range surface choices, at around $85-90/sq.ft. More complex work and special features are considered on a case-by-case basis; for instance we charge about $1200 for a concrete farm-style sink. Integral vanity sinks run about $600-750. A fantastic value, I think, for a handcrafted one-of-a-kind piece with unlimited avenues to explore. Is there a maintenance program people should follow? Maintenance depends completely on the sealer choice and use patterns. “Old school”, traditional concrete countertops were sealed (and some still are) with a penetrating sealer and waxed. These require regular re-waxing and will eventually acquire a patina, which can be a wonderful look. Then there are a multitude of topical sealer choices, some more durable than others and some requiring occasional re-application. They tend to be susceptible to abrasion, extreme heat, and perhaps difficulty to repair on site when damaged by abuse. Just as there is no such thing as a” perfect material” in the real world, satisfying every possible criteria, there is no perfect sealer. One that comes very close to that ideal, however, is reactive sealing, with a lithium densifying technology – you may encounter this in the newly popular diamond polished slab floors in commercial (and some residential) applications. A version of this (more a treatment than a sealing approach) is beginning to be used for countertops. It is water-based, food-safe, very natural in appearance and – wonder of wonders – actually improves over time! Cleanup is simply water and soap. This is the approach we are now taking, after having worked through the gamut of sealer options; we strive for constant innovation and improvement in our techniques, components, and final results. I would like to thank Richard for the transparency he has provided into his work. When I started this interview I can admit that my knowledge of concrete was limited to retaining walls, sidewalks and driveways. I know people who have concrete counter tops but I myself have never specified one. I was not aware of the possibilities available to me as a designer – from shape, texture, color, finish and material inlays. Down below you can see the progression on the fabrication process. If you have any specific questions, I will make sure to get you the answers to need; Richard and I are now like this (fingers crossed).